Mahindra Racing took points with both drivers in the first race of the season, though a tough debut race for rookie Felix Rosenqvist meant he would only finish fifteenth. Returning driver Nick Heidfeld repeated the result of the opening race in 2015 to take third place and Mahindra’s first podium of the season. It was a mixed qualifying session for the Mahindra team. Though neither driver ran into the same trouble with the changed chicane as other drivers did, the times were still not as good as they had been hoping. In the race, Heidfeld was able to make up from his poor starting position, climbing to sixth on the opening lap. The mid-race car swap ran without a hitch, and he climbed up to third in his second car, but the German was running low on energy in the closing stages of the race, hitting zero just after the chequered flag. Rosenqvist moved in the opposite direction to his team mate, though. Sixth on the grid put him right in the mix on the opening lap, and he sustained damage that lead to an early car swap. Still, the rookie was able to manage his energy well, making it to the end of the race. 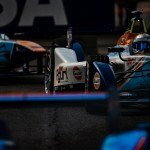 As he made his way back up through the field, Rosenqvist set the fastest lap of the race. His fifteenth place finish may have been outside, the points, but the Swedish driver took a point for the fastest lap. A relatively disappointing qualifying started Heidfeld’s season. The German was up in the first qualifying group and, though he managed third in the group, it wasn’t a quick time, and he would spend the rest of the session watching his time drop slowly down the order. Heidfeld would eventually qualify outside the top ten in P11. It was all to do in the race, but Heidfeld managed the chaotic race start well to climb up to sixth in the opening lap, gaining positions with a move around the outside of turn one whilst the those around him got into drama. During the safety car period, Heidfeld came into the pits. 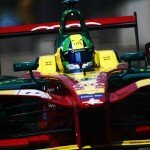 A quick stop took him even higher through the field, taking him up to third, but now it was a race against the battery power, as the amount of usable energy in his M3Electro got tighter and tighter as the race drew to a close. Heidfeld was able to make it across the line before his usable energy hit zero, putting him on the podium for the first race of the season, his first time since the opening race of last season. Best time in FP1: 1:03.954. Best time in FP2: 1:03.044. Best time in qualifying: 1:03.848. Best time in the race: 1:05.085. Pit stop time and difference to minimum pit stop time: 43.0s (difference: 1.0s). Out in the third qualifying group, Rosenqvist was quick to show the pace of the new Mahindra car. The Swedish driver’s time was enough to put him third when he crossed the line, only for fellow group three qualifier Nelson Piquet to bump him down to fourth. The rookie would eventually qualify sixth. The race would be a little harder though. Rosenqvist found himself right in the middle of the pack all jostling for position at the opening corner. Contact sent the rookie into a spin and the damage to his car meant he would have to pit early. Pitting not even a third of the way into the race meant the second stint was going to be one of energy management if Rosenqvist was going to make it to the chequered flag. You wouldn’t notice that, looking at the rookie’s climb through the field, though. 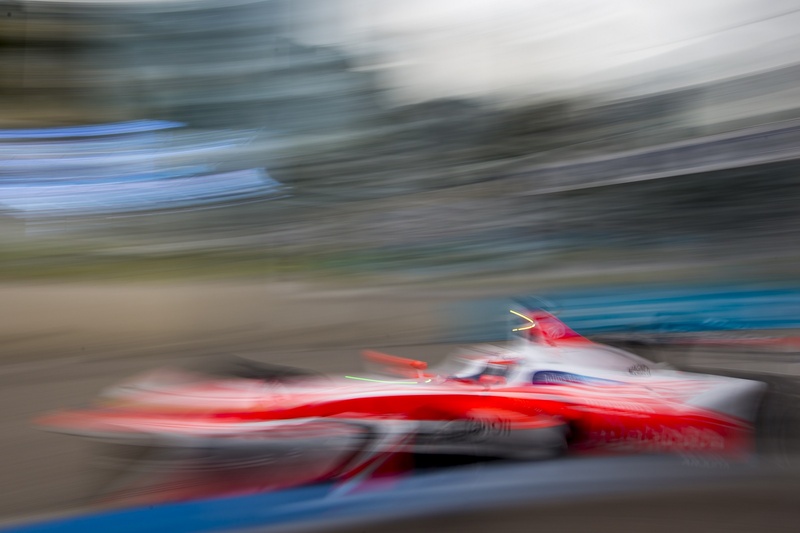 Pitting put Rosenqvist in seventeenth, but he managed to climb his way up to fourteenth by the thirty second lap. He may have been aided by retirements ahead of him, but that didn’t explain the fastest lap that Rosenqvist managed to set in his second car. Rosenqvist would cross the line fifteenth, though, with Loic Duval taking fourteenth in the closing stages of the race. Best time in FP1: 1:03.912. Best time in FP2: 1:02.825. Best time in qualifying: 1:03.332. Best time in the race: 1:02.947.